In fact, if you think of your brain as a muscle, then playing chess is undoubtedly the best exercise for it. How? Well, simply because the determination of winning pushes you into thinking strategically while analyzing the body language of your opponent so as to judge their next move. The pawns, horses, kings, and queens, set nicely across the black and white checkered board, all help you to sharpen your mind and reap in numerous benefits that you might not even be aware of while engrossed in a game of chess. Are you wondering what these benefits could be? Amaze yourself by reading about them one by one right here! The brain is undoubtedly the most crucial organ of the body, and the best way to exercise is to think healthy, obviously. When you play chess, you are actually stimulating both sides of the brain simultaneously as the left hemisphere is responsible for object recognition whereas the right hemisphere excels in pattern recognition, both equally important throughout the game. The rules and techniques involved in proceeding with the game are bound to facilitate in providing you with an effective mental workout that progressively develops your brain over time. It can actually increase your mental age up to 14 years, as claimed by several scientists. Not everyone is aware of dendrites, a branch-like extension of nerve cells that are responsible for conducting signals from the various neuron cells in your brain to the exact neuron they are attached to. Learning a new skill or engaging in challenging activities boosts its growth, and what can be a more challenging activity than playing chess? Now, how is this advantageous? Well, the more the dendrites grow, the better the speed and quality of neural communications through your brain will become. Ultimately, your brain will be endowed with an enhanced processing power and performance. According to experts, kids as young as second and third graders are known to reap the most benefits from this rapid development when they play chess. Originality and creativity are interlinked, aren’t they? When you try your luck at chess, you are bound to unleash your original and creative thoughts when evaluating the wide range of possibilities to outwit your opponent. Overall, you will be required to think out of the box in order to gain victory. Besides, there is no way that you can copy someone’s else’s move anytime as each time you play chess, it’s going to be a completely different experience even if your opponent remains the same. You will be amazed how creative thoughts start flowing in naturally while you are busy prioritizing the options with eyes glued to the game. Brace yourself for a noticeable improvement in your memory. Playing chess can actually help to enhance your memory as you not only have to remember the complex rules of the game but also be mindful of your previous mistakes in order to avoid them in future turns. In addition, with each new opponent you play, you will learn new methodologies and it would be essential to never forget that specific opponent’s play in case there is a next time. You shall also need to recall all your moves that helped you win before. Moreover, you can’t learn the different tactics and strategies used in chess by heart, that’s practically insane, instead, you will certainly develop a natural habit of implying a strategy when the need arises. This is what will help your memory shine not only in chess but also in other areas of life like academics, commitments, and overall performance. Get ready to sharpen up your problem-solving abilities while striving to win a game of chess. With so many aspects to emphasize on, critical thinking, strategic planning, analysis, evaluation, and creativity, for instance, your mental functionality is bound to increase naturally. In fact, after playing the board game a number of times, you will realize that the complexities involved in chess appear bigger than some other problems of life which in turn begin to seem easier to solve comparatively. Both you and your opponent are moving towards the same goal with the same resources, so you have to constantly predict what the other player might do and figure out your next move beforehand. It’s all about competitive problem solving with quick thinking. You never know when you will be busy concentrating on your pawn, completely unaware that your king is under attack! Striving to emerge as a winner in chess involves a lot of planning and foresight at every step, and therefore grooms these two skills accordingly. You have to get hold of smart winning tactics, strategize and plan your moves while predicting and analyzing your opponent’s counter move simultaneously. In short, in order to lead your goal, you are required to plan ahead and be prepared for the consequences of your actions after each turn. This results in better decision-making in all areas of life. Although a lot of people think that chess is a game for the brainy individuals who already have excellent IQ levels, the truth is otherwise. All that brain development, concentration and logical thinking involved in playing chess eventually leads to sharpening your critical thinking and judgmental skills as well as boosting IQ. This has in fact been proven through two studies conducted in Venezuela and Australia respectively where the participants of chess resulted in showing improved IQ within four to five months of staying involved in moving knights and rooks around. Do you think that for measuring someone’s intelligence it is only necessary to accumulate their IQ points? Well, you are mistaken! The emotional intelligence of that person, which comprises of one’s ability to evaluate and control their emotions, plays a huge role in this too. Moreover, as chess can be played by any two players regardless of their relationship, socioeconomic status, religion or culture, the game tends to groom your psycho-social skills too. Your patience and sportsmanship is going to be tested while moving towards the same goal in a highly competitive environment. Intense concentration and extended attention span are two things that are essential for playing chess. The good news is that you will learn to master these with every new game. Be aware that you can’t afford to look away or let your mind wander somewhere else while playing, unless you wish to give your opponent an opportunity to plan a smarter move while you are distracted. Chess is a pretty lengthy game which asks for your total concentration when you are at it. Training your mind to concentrate for longer time periods will lead to broadening your attention span not only in the game but also in other crucial aspects of life such as academic and career goals. A smart way to improve your child’s grade at school would be to encourage him to play chess. As a matter of fact, if the kid is weak in arithmetic, the game will help to improve his math skills without making the process boring. Yes, that’s absolutely correct, the game is known to enhance one’s arithmetic skills in addition to the countless other brainy benefits it provides. The subject itself is all about playing around with variables in your head, recognizing patterns and solving problems, and this is very much similar to a game of chess. Indeed, the major reason for chess players being proficient in arithmetic lies in the fact that the game bestows upon them the ability to think a few steps ahead by keeping track of the attackers and defenders on the board and calculating an opponent’s predictable moves. No matter how old you are, when you play chess, you will gradually find your confidence and self-esteem increasing. This is mainly because whilst lost in the game, you are completely on your own, so when you achieve a checkmate situation, you will beam with pride on succeeding in such a challenging game. In case of failure, you will have to analyze where you went wrong so as to avoid such errors in future. Each turn in the game is totally unpredictable and even if you play the game with the same player repeatedly, the level of difficulty will vary which means that the battle for victory will only get more interesting and confidence levels will shoot high. It’s all about being self-motivated to discover the best move even under pressure. Isn’t it great that this is one board game that has no age restrictions? It promises lucrative benefits not only for youngsters but even for the elderly. One such benefit is the preservation of mental acuity. As chess lays emphasis on a player’s ability to understand key concepts and determine cause and effect patterns, old-age players remain at a reduced risk of being affected by diseases like Alzheimer’s, dementia and schizophrenia. This is because this mind exercising activity keeps the brain functioning at a normal rate and increases intellectuality instead of letting depression and anxiety setting in with age. Do you know anyone who has recently suffered from a stroke or an accident that has left them physically disabled temporarily? If yes, then invite them for a game of chess! In addition to improving the brain functionality, chess is also an excellent tool to develop fine motor skills that can help such individuals recover more quickly. It is actually a two in one benefiting game for such patients as the moving the chess pieces in different directions can help in fine tuning motor skills while the mental effort involved stimulates deep concentration and calmness. So what are your thoughts on playing chess? Doesn’t this game sound marvelous after all? The best thing is that you can play it regardless of your age or gender. Every second that ticks by while you are anxiously planning your next move on the board is actually worth it. In a nutshell, chess is a brilliant investment for students, professionals, house-makers and children alike. So what are you waiting for? Grab a chessboard and set out to bask in as many mental and emotional benefits as you can by exploring your creativity skills at the game. It’s a fun and intellectual way to spend your free time for sure! That is really cool that chess can help enhance your memory. I have been wanting to help my son improve his memory for school, but I didn’t know what I could do. I will have to see if he will give chess a try. Hi Deb, you should definitely encourage your son to give chess a try. It will not only help with his memory but so many other things. All the best! 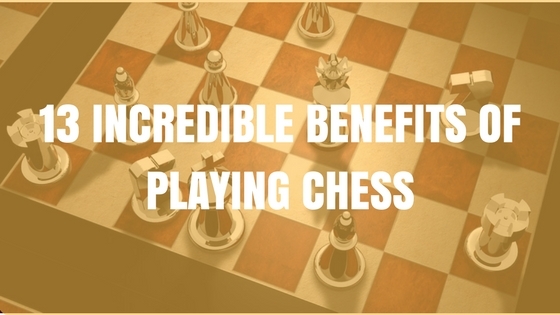 Thank you for the post on the 13 incredible benefits of playing chess. I definitely agree that playing chess is a great workout for your brain. You are forced to think about so many things at once like what moves your opponent is going to do and how you are going to counter them.